Rowman & Littlefield Publishers, 9780742534018, 160pp. Although he has fallen into undeserved neglect in the twentieth century, the early nineteenth century viewed James Kirke Paulding as one of the giants of American literature. As essayist, satirist, novelist, poet, and critic, he labored to promote an American conscious in letters, independent of an overbearing English influence. Arguably his chief contribution to nativism, however, was his writing for the theater. The Bucktails turns British disdain for their crude, uncivilized former colonists against the effete representatives of the Old Order. The Lion of the West, written more than a decade and a half later, not only scored a great popular success on both sides of the Atlantic but also supplied a template for the conventional portrait of the Westerner and for the humor of the Old South West. 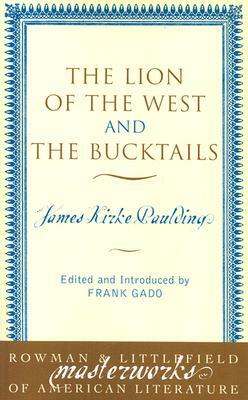 James Kirke Paulding was one of the giants of American literature. As essayist, satirist, novelist, poet, and critic, he labored to promote an American conscious in letters, independent of an overbearing English influence. Arguably his chief contribution to nativism, however, was his writing for the theater.